So You Want to Run a 5K? Maybe you’ve run multiple 5k’s and want to improve your time. Maybe you ran your first 5k and now you are addicted. Maybe you’ve never run a day in your life and want to try your first 5k. No matter what your story is, training for a 5k is always beneficial. Personally, I have ran more 5k’s than I could count and I have trained for almost each of them, whether it be with a team or on my own. And I’ll be the first one to tell you, that the most painful and worst 5k’s were the ones where I had no previous training. Each person is a different skill level and that makes it hard to say where you start training. If you need help finding a training program to help you achieve your goals, this would be a good place to start. But finding the training program isn’t the hard part. The hard part, in my opinion, is sticking to the training plan and eating the part. Get a pair of running shoes. Before you start training, I would get a good pair of running shoes. Check out this website to see what type of shoe you should be wearing. A lot of running injuries result from wearing shoes that aren’t meant for your type of foot. The last thing you want to do is get a running injury before you even get the chance to do your run. Get a running buddy. Now this may not be for everyone, but if you like having someone to help push you and talk to on your runs, then I would highly suggest finding someone who will do just that. Get new music or running gear. Having new stuff helps you get the motivation to take the hardest, first step out of the door. The new music will help you keep going once you get out there. Try and make a running playlist that has more upbeat music that will keep you going at a good pace and keep your focused. Having music playing will also help you from hearing how hard you’re breathing and will keep your mind off of how tired you actually are. Make friends that are running the 5k with you. If you surround yourself with people that also are going to train, it will make finding a running partner that much easier. Not to mention that when you two hang out you probably won’t be going out for unhealthy food and beer. The hardest part of staying in shape for races for me is eating healthy. If you have friends that want to eat healthy too you guys will be good influences on each other. Hopefully. Post Running Routine. If there were anything that I truly learned from running, it would be the importance of caring for your body after running. The general rule of thumb is to stretch each muscle for about 45 seconds, deepening the stretch as you go. Here are five great stretches for runners. Another thing I found out the hard way would be to ice. If it hurts, ice it. 15 minutes on 15 minutes off. I’m not a doctor so I can’t tell you that it will work for everything, but in my cases most of my injuries would have been prevented if I stretched properly and iced more often when I felt pain. After you’re putting mile after mile on your legs, your muscles develop scar tissue and tension that need to be taken care of. If you’re starting to feel pain and don’t know what to do, here is a good website. I hope that I have had a positive impact on someone to try a 5k or better their time in a 5k. Also, if you are from the Whitewater area, I would highly recommend this run, September 21st. Whitewater does a wonderful job organizing this and has multiple options for races including the half marathon, 5k walk/run, and fit kid shuffle. I partook in the 5k last year and will be doing in again this year. I hope to see some of you there. The number one excuse for not exercising is time. I find myself trying to find as many excuses as possible to not work out. We as students do have very busy days between going to class, doing homework and maintaining a social life on top of many other responsibilities we are held accountable for. Despite our exceptionally busy days, working out should be one thing that we make time for. Working out has huge benefits to your health along with your physical appearance. Working out can help you sleep better, reduce stress, increase your energy, slow aging and has much more to offer to your health. You owe it to yourself to commit, at the very least, a 30 minutes a day to exercising. Exercise doesn’t have to take place in the gym or last hours either. There are many alternatives and tips that help me fit exercise into my busy daily agenda. Wake up earlier. Going to bed earlier and waking up earlier in order to get a workout in can make your day much better and healthier. Working out in the morning increases your energy for your busy day, improves your learning capabilities, reduces stress, enhances your food consumption choices and above all, it gets your workout out of the way, leaving the rest of your day up to you. Make a workout schedule. Give yourself a reason to be at the gym or a time to be exercising. You are more likely to exercise if you have an obligation to do so. If you have a class time, chances are you will be there or will feel guilty if you miss it. Make yourself feel the same way about exercising. How about making a date with a fitness class or a friend who would also like to get a workout in?! Cut back on video games, television and social media. Go ahead and record how much time you spend on Facebook, watching TV or playing video games every day. Chances are most of us could cut that time down in order to get our quick workout in. Better yet, do both! The Williams Center weight room and University Fitness Center in Wells have TVs in front of the cardio equipment! Be active while on media. If you can’t cut down on the time you spend on facebook or have a TV show you must watch, multitask. During a commercial, do pushups, jumping jacks or whatever exercises you like doing. Make a small workout plan for every time your show cuts to a commercial. Those 5 minute commercial breaks can add up. Exercise the way you like. You shouldn’t hate to workout. If you enjoy swimming find a place where you can swim. Listen to music while running or find a running partner. Whatever you enjoy, you should incorporate it into exercising somehow. Not only will you be more likely to go through with working out but you will have fun while doing so and add some fun to your life. Become involved. There are plenty of options you have to be actively involved with the community. Join a club, an intramural team or simply get a group of friends together and throw a ball around. There are many opportunities to become actively involved around campus. There are 18 different intramurals you can join and even more clubs along with many group fitness class offered for free from the university with your fitness membership. Why not play a sport you enjoy playing while getting the exercise you need? Exercise shouldn’t be treated as just another chore that gets put off and forgotten about. Not only is it important for your health to make sure to exercise regularly but it should be fun and something to help you through your long, busy day. This week I’d like to talk about the Discover Whitewater Series that took place in Whitewater on Sunday September 22nd, 2013. The event was put on by The Greater Whitewater Committee, Inc. and was open to the public to participate. The event was held according the official website, “To promote tourism to the city and show participants all that Whitewater has to offer.” Let me tell you, they pulled it off. 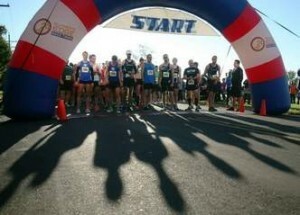 Hundreds of people came out to participate in the half marathon, 5k, or Fit Kid Shuffle, and had a blast doing it. Although I didn’t get the opportunity to participate this year, it was such a thrill to be able to go and support local members of the community! If getting to know your city better wasn’t enough incentive, the event also gave medals to all of the participates, as well as prizes for the top finishers. So my challenge to you is to sign up next year and rise to the occasion of competing in a local race. If you “like” the group “Run Whitewater” on Facebook, you can get updates on next year’s race and general running information. The races began at the Whitewater high school and led the participants through a scenic route of Whitewater including The University, Fairhaven’s Prairie Village, the Whitewater Industrial Park and Whitewater University Technology Park. This route allowed the participants to see more than just Main Street and really appreciate the beauty of Whitewater! If you have ever thought about signing up for a race but have felt a little bit too intimidated (like me), let me assure you that it is not intimidating at all. The whole event is filled with music, laughter, and you are greeted at the finish line with cheerful, clapping volunteers who hang a medal around your neck. People of all ages came out to the event to rise to the challenge, and when I say all ages I mean anywhere from 3 years old to 60+ years old. So do yourself a favor and don’t let fear hold you back. Give it a try; there was never any harm in trying! The event donates all of the proceeds to “five local organizations in an effort to build a stronger community.” The Bethel House, UW-Whitewater Field & Cross Country, W3 (Working for Whitewater’s Wellness), Whitewater Unified School District and the Whitewater Aquatic Center.